Belarusian Olga Govortsova, along with currently being the No. 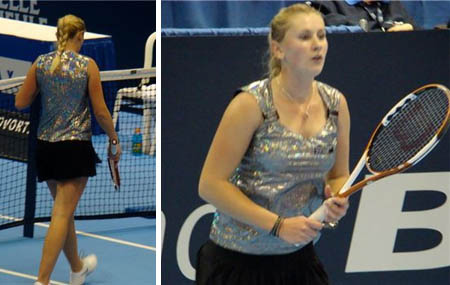 2 Belarusian player on the SEWTA Tour, is dropping hints of a Bethanie Mattek-esque fashion sense. Here’s a photo of her playing the Quebec City Bell Challenge last month. We’re all about stirring the fashion pot, but it looked like Olga’s glittery top wasn’t built for tennis: “She clearly looks pretty uncomfortable with the ensemble, always tugging and pulling it down and adjusting the ties,” says Stephanie Myles. It’s hard to say if the fashion will get in the way of her play (fyi, she’s ranked about 50 spots above Mattek); while she may have lost to eventual finalist Julia Vakulenko in the quarters of Quebec, she can also be proud of her one Top 20 scalp in 2007 (Shahar Peer at Stanford). Kudos: By the way, for those of you who griped that coverage of the Quebec tournament was almost non-existent, Myles did a mighty fine job keeping us abreast of happenings above the 49th parallel. Check out the blogging here. 4 down, 997 to go!